Do you have a root-canal-treated tooth, a large existing filling, or a broken tooth? Would you simply like a more aesthetic smile? If you’ve answered “Yes” to any of these questions, crowns from Metrowest Dental Center could be right for you. Crowns are “cemented” onto an existing tooth and fully cover the portion of your tooth above the gum line. In effect, the crown becomes your tooth’s new outer surface. Crowns from Metrowest Dental Center are made from high-quality, extremely durable ceramic. 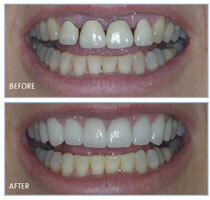 They are custom-made to match the color and shape of the surrounding natural teeth perfectly. During your first appointment at our Marlborough dental office, we will take an impression of your teeth. This impression will enable our lab technicians to create a crown that will function seamlessly with the rest of your teeth. When your crown is completed, you’ll return to our office, where one of our highly qualified dentists will permanently adhere the crown to the remaining natural tooth. Just like your natural teeth, crowned teeth need to be kept clean with regular brushing and flossing, and twice-yearly professional cleanings.